NEW YORK -- Robot cars make for annoying drivers. Relative to human motorists, the driverless vehicles now undergoing testing on public roads are overly cautious, maddeningly slow, and prone to abrupt halts or bizarre paralysis caused by bikers, joggers, crosswalks or anything else that does not fit within the neat confines of binary robot brains. Self-driving companies are well aware of the problem, but there's not much they can do at this point. Tweaking the algorithms to produce a smoother ride would compromise safety, undercutting one of the most-often heralded justifications for the technology. It was just this kind of tuning to minimize excessive braking that led to a fatal crash involving an Uber autonomous vehicle in March, according to federal investigators. The company has yet to resume public testing of self-driving cars since shutting down operations in Arizona following the crash. If driverless cars can not be safely programmed to mimic risk-taking human drivers, perhaps they can be taught to better understand the way humans act. That is the goal of Perceptive Automata, a U.S.-based startup in Boston applying research techniques from neuroscience and psychology to give automated vehicles more human-like intuition on the road: Can software be taught to anticipate human behavior? 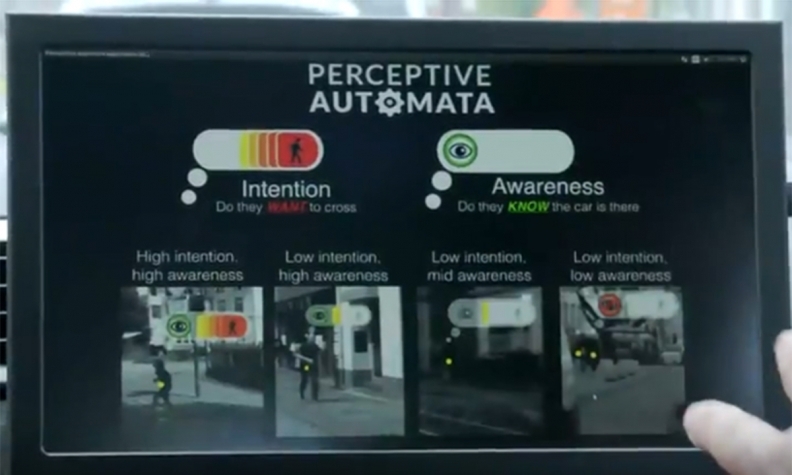 "We think about what that other person is doing or has the intent to do," said Ann Cheng, a senior investment manager at Hyundai Cradle, the South Korean automaker's venture arm and one of the investors that just helped Perceptive Automata raise $16 million. Toyota is also backing the 2-year-old startup founded by researchers and professors at Harvard University and Massachusetts Institute of Technology. "We see a lot of AI companies working on more classical problems, like object detection [or] object classification," Cheng said. "Perceptive is trying to go one layer deeper — what we do intuitively already." This predictive aspect of self-driving tech "was either misunderstood or completely underestimated" in the early stages of autonomous development, said Jim Adler, the managing director of Toyota AI Ventures. With Waymo planning to roll out an autonomous taxi service to paying customers in the Phoenix area later this year, and General Motor's driverless unit racing to deploy a ride-hailing business in 2019, the shortcomings of autonomous cars interacting with humans are coming under increased scrutiny. Some experts have advocated for education campaigns to train pedestrians to be more mindful of autonomous vehicles. Startups and global automakers are busy testing external display screens to telegraph the intent of a robotic car to bystanders.